Mammalian oocytes occupy a critical nexus in reproduction as they not only contribute half the genetic makeup of the embryo but also provide virtually all of the cytoplasmic building blocks required for sustaining embryogenesis. The journey that transforms a primordial germ cell into a mature oocyte (or egg) capable of fertilisation and embryonic development is of unrivalled complexity. The end-product of this remarkable developmental process is the "mature" egg, now replete with macromolecules and organelles, and poised to support embryonic development if fertilisation should occur. Given the importance of the oocyte for embryonic development, it is of no surprise that the oocyte holds centre stage in fertility clinics and greatly influences the outcome of assisted reproductive treatments (ARTs). Mammalian Oocyte Regulation: Methods and Protocols provides a highly diverse compendium of detailed methodologies - primarily focusing on the murine model but also including chapters on human oocytes - for enabling researchers to interrogate every aspect of mammalian oocyte development including recombination, meiotic maturation, oocyte substrate uptake, chromosomal segregation and fertilisation. Written in the highly successful Methods in Molecular Biology ™ series format, chapters contain introductions to their respective topics, lists of the necessary materials and reagents, step-by-step, readily reproducible laboratory protocols, and notes on troubleshooting and avoiding known pitfalls. 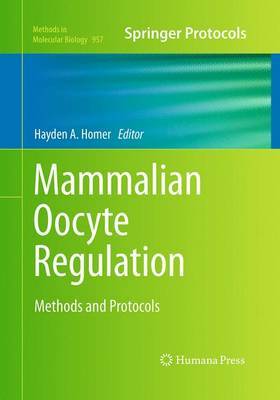 Authoritative and easily accessible, Mammalian Oocyte Regulation: Methods and Protocols serves as an ideal guide to novice oocyte researchers, experts who wish to add another dimension to their established portfolio, as well as the wider research community.